Renovating an existing staircase will be the least expensive option and changing balustrading (spindles, handrail and newel posts), or cladding stair treads and risers, is a quick and easy solution. DIY kits start from as little as £200 to £300, though this figure can soon rise depending on the materials used. Alternatively, staircase companies offer a full design and installation service, which involves updating all non-structural staircase parts in situ. This starts from around £2,000. If your existing stairs are badly positioned, it may be worth moving them. While this can be achieved by a keen DIY-er, do bear in mind that replacing stairs is comparable to knocking down a structural wall, so it's important to consult an architect or specialist company for advice. For a basic off-the-shelf MDF and plywood straight run or a spiral staircase, you can expect to pay £200. This rises to £500 for a softwood design. A complete self-assembly kit (a popular choice for spiral staircases) tends to cost around £1,000 to £2,000, while modular stairs (which come complete with a greater design choice and full installation) are between £2,000 and £5,000. The most expensive option, bespoke staircases start from £5,000 but rise to £20,000 to £90,000. Whilst it may seem expensive, this does include all project management, installation – and the result will be a unique installation. The issues of staircase safety and comfort are dictated by building control regulations. If you’re updating or replacing a staircase, you’ll need to seek building control approval to ensure the stairs are designed well, safe to climb and easy to navigate. The most important measurement is the total rise – the vertical distance from floor to floor. This dictates the number of ‘rises’ (also known as verticals) and ‘goings’ (also known as flat steps or treads). Rises must all be the same height – between 19cm and a maximum of 22cm – whilst all goings must be a minimum of 22cm. The maximum allowed pitch of a staircase is 42 degrees. There must be a minimum of 2m head height at all points on and off the staircase (though this can be a little less for loft conversions). While there is no minimum width for domestic stairs, most are 86cm – very narrow secondary staircases are allowed but require approval from building control. A landing must be provided at the top and bottom of a staircase – this is usually a little wider than the width of the staircase. A handrail is essential on one side for stairs less than 1m wide. Balustrading is essential for anything more than two risers. Once you’ve taken time to research staircase specifications and regulations, you can start thinking about a design that's practical and suits the style of your home. While a staircase is a major feature in any house, its potential for design impact is often overlooked, particularly in older properties. With so many clever ideas and stylish solutions now available, it’s worth considering an update during a house renovation or when designing a hallway. Think about how your staircase fits within your home and make sure to position it so that space is maximised upstairs and downstairs. While some staircase designs look beautiful, they're not practical for everyday life – take time to consider whether they will encourage noise to echo through the house or pose a challenge to family life. Top tip: Make sure you double (and triple) check measurements before investing. In terms of material, timber, glass, metal and concrete finishes are equally lovely options as long as they suit the property they're intended for. Take time to think about the age and aesthetic of your home and opt for something that will stand the test of time. If you're uncertain, seek the advice of an architect. Timber: Often the go-to material for staircases, timber is sturdy, reliable and versatile. Paint white or grey and couple with a runner for a timeless finish or opt for a bolder painted finish if you're looking to make a statement. Glass: Toughened safety glass can be used to create stylish stair treads or glass balustrades, adding light and a spacious feel. To provide slip-resistance, stair treads must have an embossed top layer. Metal: Modern and unapologetically simplistic, a metal staircase is worth considering if your style is more contemporary or industrial inspired. Concrete: Whilst concrete has a tendency to overwhelm living areas, it's a great option if you're designing a basement staircase. A floating (or cantilevered) staircase, where the treads look as if they are defying gravity, is an understatedly striking option if you want your staircase to act as a focal point. More often found in contemporary homes, they're equally suited to older properties with a structurally sound wall to conceal the support framework. For a minimalist feel, consider opting for timber, stone, Corian or glass steps. If you're keen to create an eye-catching or bespoke look for your staircase, consider opting for a statement balustrade. Light colours or glass finishes can create a more fluid effect while enhancing the light and bright feel of a hallway. The flowing arc of a spiral (or helical) guides the eye upwards, creating a striking focal point. Perfect as the centrepiece of a grand hallway, it will also look beautiful in more compact spaces. If you're blessed with a large hallway and high ceilings, consider investing in a stone staircase with a classic design. In the right setting, a light stone finish makes for a striking centre piece in a grand entrance hall or a period or new-build property. 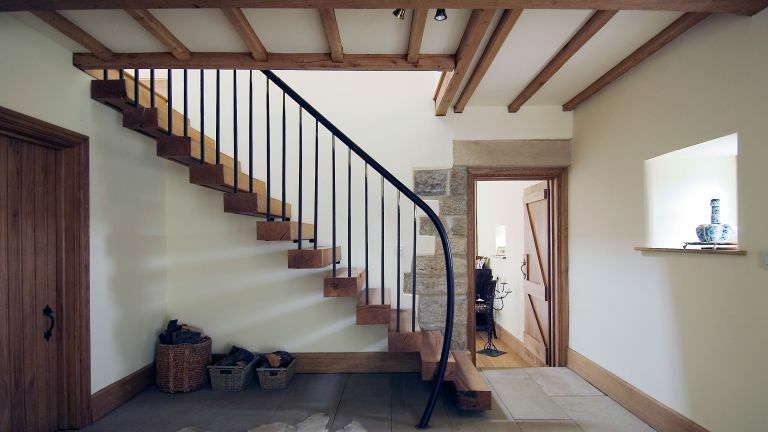 A timeless architectural feature, we love this Stone Cantilever Country House Staircase from Bisca. Modern staircases can look out of place in a traditional home. For a more sympathetic update, lose uniform chunky spindles and try characterful black metal designs that will work perfectly with cast-iron door and window furniture. Slimmer spindles are a great solution for smaller homes, too, as they will help to create a light and spacious effect. It's important to ensure that you begin planning staircase lighting at an early stage, particularly if you want the lights to be subtle and unobtrusive. Another key consideration is fixing points. Whether you’re lighting from above, at tread level or in the wall, factoring the lighting into your plans is really important in ensuring you achieve the correct finish. Take time to read our guide to staircase lighting if you'd like more advice. Looking for more hallway and staircase advice and inspiration?